PAWHUSKA, Okla. (Tuesday, November 8, 2016) – The oldest living relative of a WWI Osage Code Talker will receive a proclamation and a silver medal recognizing her grandfather’s wartime contributions, at this year’s Veterans Day Dance in Pawhuska, Okla., on Friday, November 11. The special recognition has been made possible by diligent efforts by the Osage Nation Office of the Chiefs to finally recognize the historic contributions of Osage Code Talkers. Augustus Chouteau was confirmed as a WWI Osage Code Talker by the Department of Defense. 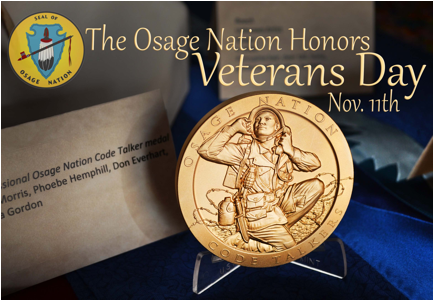 To mark this fact, the United States Mint created a sold silver duplicate Osage Code Talker medal to be presented to the Chouteau family. Osage Nation Principal Chief Geoffrey Standing Bear will read the proclamation and present the medal to Chouteau’s granddaughter, Francis Chouteau Jones, at 2 p.m. The timing for the events leading up to this occasion perfectly coincides with the traditional honoring of Osage veterans that takes place every year at the Post Legion 198 Veterans Day Dance. The Hominy War Mothers are hosting the dance this year and are providing a program with a list of Osage family songs and the day’s agenda. It is a long-standing Osage tradition for the families of Osage veterans to donate beautifully decorated Veterans Day cakes with the name of their family member written on the cake. These cakes will be available for everyone attending to enjoy along with a traditional Osage meal at 5p.m.